Stroll around most major North American cities and you’ll find a large community of Korean restaurants and stores that illuminate the downtown core and surrounding neighborhoods. Chances are you’ll find a large library of Korean film in your local video store if you live in an eclectic hub like Montreal, or if you happen to be visiting Japan, you’ll get to see one of K-pop’s hottest quartets 2AM at K-Fest Summer! – an event entirely devoted to the media phenomenon. 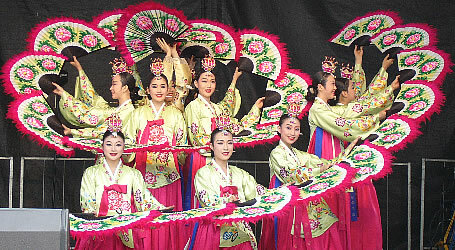 From university Korean Societies to entire communities of expats and second generations, the presence of Korean culture is loud, strong, and welcomed with open arms around the world. Korean cuisine is one of the most popular cultural exports showing up on the menu of trendy eats today. Healthy and delicious, bulgolgi, gimbap, mandoo and kimchi grace the tables in restaurants which are cropping up in every borough, where establishments strive to produce a fine-dining experience with a peaceful and classy ambience resonating Korean cool. It’s become a staple of cosmopolitan education, with westerners striving to perfect their palate, master the use of chopsticks, and turn their hand to making Korean recipes at home – made easier by the increasing number of Korean markets, catered to everyone. But food isn’t just the only aspect of Korean culture to take the world by storm. The K-pop industry is a booming economy, generating more than 700 million US dollars per year. Sensations like Super Junior, Big Bang, SNSD and soloists like Rain and Hyorin are just a few of the big-star names to hit the charts, not to mention the smash wonder “Gangnam Style” by Psy, scoring over 2 billion views on YouTube and followed by a wave of fan-made tributes. Glamorous looks, skilled choreography and passionate lyrics in the form of ballads and beats have captured the hearts of youngsters everywhere, evolving into its own unique subculture. In the same vein, Korean dramas are becoming another sought-after commodity on television networks and online. From the historical epics to contemporary romance, “drama fever” has been raging overseas with avid followers in China, Japan, the Philippines, and America with its highly-charged characters and conceits, and a powerful theatricality which has become so provocative to global audiences. Its literary counterpart, Korean animation or Han-guk Manhwa Aenimeisyeon, is promising to make a big splash in the cartoon world this year with its UK debut The King of Pigs inspired by Clint Eastwood’s Mystic River. Without a doubt, Korean cinema has achieved mightier success with the Korean film industry valued at approximately $1.4 trillion US in 2012. The juxtaposition of the brutal and beautiful in thrillers like Chan-wook Park’s Oldboy, (2004 Cannes Festival Grand Prix Winner) has ignited a long-list of masterpieces occupying record stores, mainstream venues, and international film festivals. Now, cities on the other side of the world are devoting their entire program to Korean content; from summer celebrations in Toronto, Canada to The London Film Festival coming up in autumn, people want more of this poignant art form which eludes competing industries. Recognition from leading universities, directors and actors have helped to cement Korea’s artistic legacy onscreen, as well as invoking Hollywood to take on bleaker, more complex imagery itself. Yet film isn’t the only genre to ride the Korean Wave. Korea’s magnificent history of traditional and modern art is dominating exhibits and living rooms worldwide. From the ground-breaking work of Nam June Paik to the Korean Bell Gardens at Meadowlark in Virginia, US, more people are seeking to fulfill their curiosity surrounding Korean culture, even imitating it. Workspaces, cafes, and homes from abroad are adopting a Korean décor and filling their spaces with Korean art, while ambitious architects construct new buildings which suggest a hint of Korean flavor and lobbies are lulled to the haunting tones of a Korean folk tune, yet another export which has received popular applause thanks to the likes of soprano Jo Sumi and others. Since Korea co-hosted and dominated the 2002 World Cup, the world has shifted its eyes towards the peninsula. National team captain and Manchester United midfielder Park Ji Sung has enjoyed a rapturous response from English fans as well as at home. Olympians Park Tae-Hwan and compatriot Kim Yuna have stunned audiences with their spectacular performances, while mountaineer Oh Eun-Sun crossed a milestone for women by becoming the first female explorer to scale the world’s tallest peaks. Korea’s soccer and baseball teams continue to set the bar high and show the world what perseverance, persistence, and passion can achieve. Be it Taekwondo – the national sport which enjoys great popularity in the West – or pro-gaming for the strategy-based game Starcraft, Korea’s role is ever-increasing the multiculturalism – as well as the caliber – of the sporting world. It’s not just about icons and mass-media, though. While not exclusively Korean, Buddhism and Confucianism have influenced the habits and practices of much of the world. With a highly capitalist society striving to find meaning, people are turning further east to find answers for their daily struggles. Temples, classes, and courses are now regular aspects of cosmopolitan city life, and several bookstores and libraries accommodate this curiosity by supplying a comprehensive spirituality section geared toward newcomers with a western perspective. The love-affair with Korean culture has drawn in people who to experience it first-hand as well, with more than 11 million overseas visitors making the peninsula their destination of choice in 2012. Due to economic and corporate investment, the country has also attracted native English teachers – primarily from Canada, Australia, and the US to make Korea their home for a few years. Thanks to an excellent health care service for visitors, bilingualism, efficient transportation system and friendly, helpful people, Korea has become one of the most accessible destinations in East Asia. The great health service provision is of importance to many visitors and ex-pats, who take advantage of local facilities as well as additional health resources online. It’s one of the best choices for working abroad, attracting the best young minds of the west while Korea continues to implement its own innovative ideas with industry-leading powers like Samsung (with a net worth of over $200 billion and Apple’s best competitor in the tablet generation) and car manufacturers like Hyundai. While Korea continues to pave the way for the future, more global companies, institutions and organizations look for Korean minds. An unbeatable work-ethic and desire for perfection, as well as the vast trove of historical and cultural treasures which are distinct to Korean heritage have enriched and enlightened the lives of millions of people all across the world, and will continue to do so for generations to come.